Be the first to share your favorite memory, photo or story of Helene. This memorial page is dedicated for family, friends and future generations to celebrate the life of their loved one. 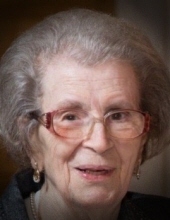 Helene (Nitsa) Arges, 94, of Highland IN, passed away February 2, 2019, surrounded by her loving family. She was preceded in death by her beloved husband Steve J. Arges. They shared a married life of 67 years. She was born in Tripolis Greece as one of six children to Vasiliki and Dimitrios all of whom preceded her in death. Steve and Helene had four children but faced a tragic loss of the youngest child Peter who passed away due to illness at the age of four. She is survived by the remaining children Betty (CG) Voukidis, George (Patricia) Arges, and Demetria (George) Bakris; 9 grandchildren, and 9 great grandchildren. Surviving in-laws include Gus (Demetra) Arges, Ismini (late Chris) Arges, Katina (late Bill) Kotsis, Maria (late John) Kotsis; and Kiki (late Sotiros) Kotsiopoulos. She was an Aunt to numerous nieces and nephews; and godmother to several godchildren. She was a life-long friend to many and will be missed by all. She served in various charity organizations including President of the St. Demetrios’s Ladies Society and an officer in the Philoptochos Society. Her main love was being a homemaker. She enjoyed sewing, embroidery, knitting, babysitting and was an exceptional cook of Greek cuisine. Visitation is on Thursday from 3:00-8:00pm at BURNS-KISH FUNERAL HOME, 8415 Calumet Ave. Munster, IN, a Trisagion Prayer Service will be held Thursday evening at 7:00pm. Funeral service will be held on Friday February 8, 2019 at 10:00 am directly at St. George Greek Orthodox Church, 528 77th Ave. Schererville, IN (intersection of 77th & Lincolnwood), with Rev. George Pappas officiating. At rest, Elmwood Cemetery, Hammond IN. In lieu of flowers, donations may be made to the St. George Greek Orthodox Church of Schererville, IN. To send flowers or a remembrance gift to the family of Helene Arges, please visit our Tribute Store. "Email Address" would like to share the life celebration of Helene Arges. Click on the "link" to go to share a favorite memory or leave a condolence message for the family.